The broad-based small cap index RUT, has taken a pretty good price beating over the past several weeks, thus it may be of interest to check out a few of the internals and sentiment indicators associated with the small caps. The first chart is the RUT components' $ weighted UD volume MCO. The raw data is derived by multiplying the daily close by the daily volume of each RUT component member, assigning the advancing members' result to the "Up $ weighted UD volume" column and the declining members' product to the "Down $ weighted UD volume" column. With the resulting daily numbers, one than performs the usual arithmetic for deriving MCOs, etc. The $ weighted UD volume MCO has yet to generate a divergence with price during the latest price down leg, which is uncharacteristic of this and other MCO variants, when solid price bottoms are established. The good news is the strength of the $weighted MCO relative to price during the latest bounce. With any further RUT price weakness, the MCO is well postured to put in a nice divergence. The MCO has a couple of significant hurdles to overcome, the zero line and the controlling resistance trendline at about +11, before an "all clear" can be declared. Next is the RUT component cumulative $ weighted UD volume line. In the event the blue curve cumulative $ weighted UD volume line can overcome its previous support line, RUT price will likely follow due the the leading nature of this tool. Therefore, no positive divergences here yet. The RUT component AD MCO has been finding good support in the -75 zone over the past couple of months by putting in a triple bottom. Darris, a TW member, and I have noticed once the RUT AD MCO reaches an oversold condition below -75 for the first time, in this case early August, the RUT price tends to ultimately bottom 3% to 6% lower than the effective price when the first oversold MCO posting is made, within a two to three month time period. From the mid-August low, RUT is now down a little over 5.5%, thus its price decline is in the range, as well as the usual time window. The percentage price loss and time frame works best when the RUT AD MCO is closer to -100, so "in the fullness of time" we'll see how this latest event plays out. The RUT UD volume MCO is a bit sloppier than its AD MCO cousin. A little over a week ago, the UD volume MCO declined to -82, negating any positive divergence possibility, along with taking out the MCO lows of early August as well as the mid-April 2005 low. If RUT were able to muster up a rally in the near term, the UD volume MCO will need to blast through zero, convincingly take out its controlling resistance line, take out the double top around +30, and lead the AD MCO upward. The RUT UD volume MCO has some tough work ahead of it for the all clear signal. 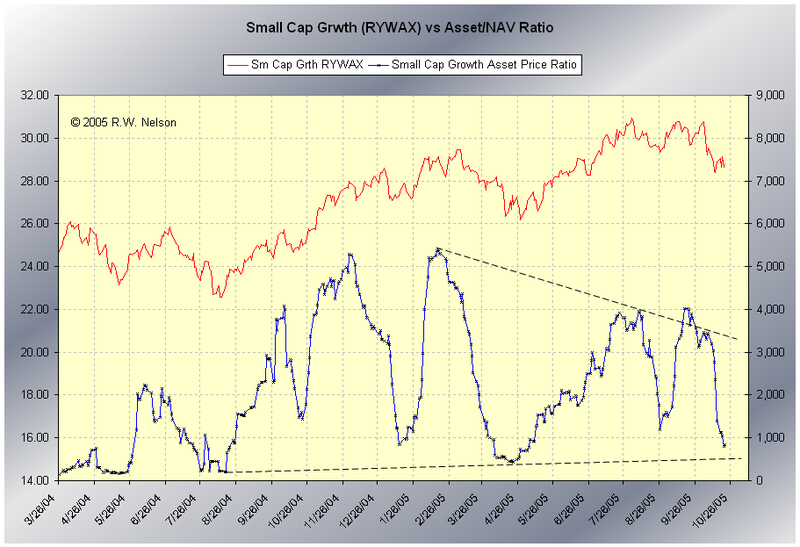 Small cap sentiment has clearly migrated to the bullish camp. 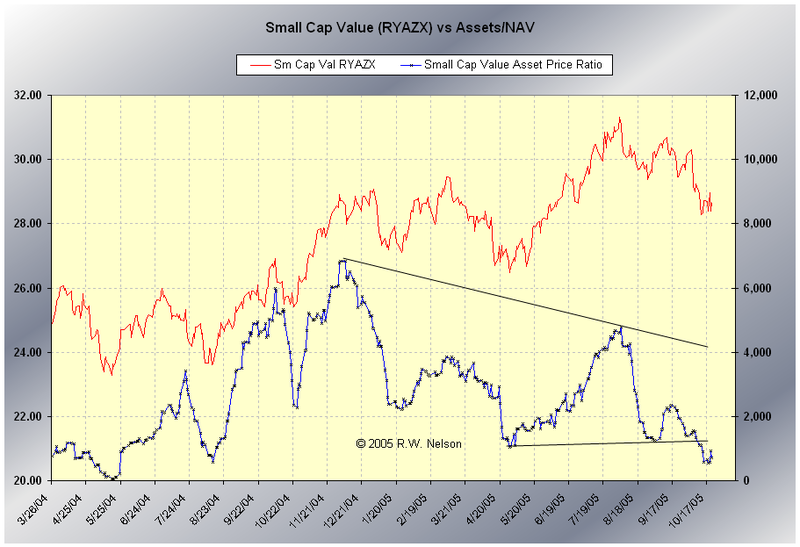 The below chart is Rydex small cap value fund asset flows, adjusted for NAV changes. The history of this fund is not long (about 20+ months), but it is clearly at levels where price bottoms have been establish over the past year and a half or so. 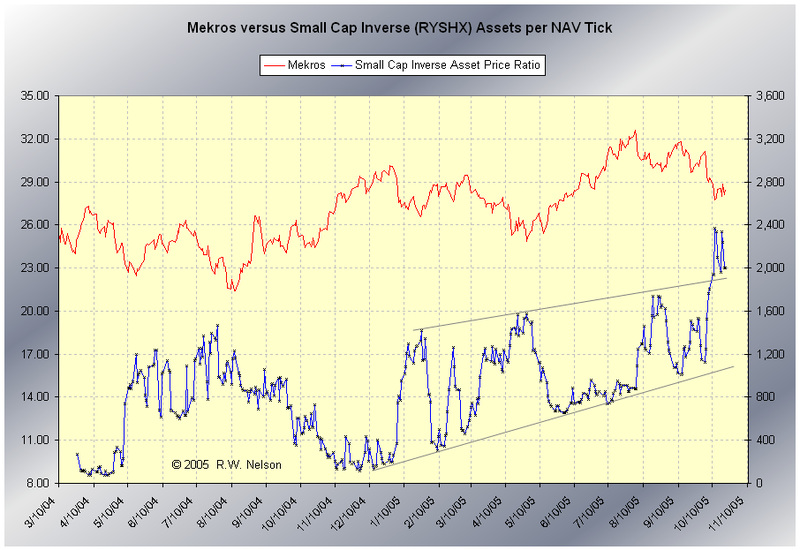 The same type of chart for the more established Mekros fund (not shown) is exhibiting the same "out-of-favor" status. Next is the Rydex small cap growth fund, which finally gave it up over the past couple of weeks, and is now in the same territory where price bottoms are usually made. The Rydex small cap inverse (short) fund asset flows, adjusted for NAV changes, blew out of its controlling channel resistance a couple of weeks ago, reaching unchartered territory. Note thus far during the near term price bounce, this indicator is finding short term support near its former resistance, which implies the Rydex traders don't believe this decline is over... a bullish event. I forgot to upload the RUT-IWM liquidity premium chart to the host serve, but it generated a buy signal as well last week. 1) sentiment-wise, there is sufficient fear for a bottom to form. Of course, sentiment indicators can remain oversold, and get further oversold before a price bottom is established, but at least there isn't rampant bottom fishing in effect. 2) Divergences (MCO, etc) that usually accompany a price bottom, did not convincingly materialize last week with the RUT breadth indicators. Therefore, there may be more work for RUT before a solid bottom is in, but the setup is in place for such a bottom in the not too distant future. Excellent input, as always. Did you know that the final 3 charts are not visible - perhaps not uploaded to your server or there may be errors in the URN spec. I would like also to see how the RUT AD MCSUM looks like. Perhaps you can post that chart when you have a moment. You stated: "The RUT component AD MCO has been finding good support in the -75 zone over the past couple of months by putting in a triple bottom. Darris, a TW member, and I have noticed once the RUT AD MCO reaches an oversold condition below -75 for the first time, in this case early August, the RUT price tends to ultimately bottom 3% to 6% lower than the effective price when the first oversold MCO posting is made, within a two to three month time period." Interesting observation. It appears RUT has already achieved the 2 month time and 3% price expectations. My own drive-by TA (looks at only price and nothing else) has a target of 606 for the RUT in early Nov, which matches your 6% discount and 3 month time from the August lows of 645. RUT bounced from .618 fib level of the April-August advance at 615. I see a gap at the 603 level in the futures and 59.35 level in IWM, which may get filled in any upcoming purging price action. This level may be the maximum downside risk. Hope you had a nice holiday and welcome back. GEO, this will do till he can correct. Copy and place each TOTAL, all of it, address in your browser. At least it worked for me. Thanks for the alert of the three charts not posting, I thought I checked it, but who knows. I hope its fixed now. The oversold AD MCO consequences for RUT have shown up several times over the past few years, and I have also seen the behavior in the other indices. Typically, a MCO posting closer to -100 works the best, so time will tell on the -75 level seen lately. Maybe the triple bottom will serve the same purpose. Thanks again Scott and Geo for your comments and alert about the "dead" charts.